Congratulations to the latest winners. Theresa dV of Point Richmond, CA won Chevy Stevens' Still Missing, and Laura Lippman's I'd Know You Anywhere will go to Kathy D. of New York, NY. I'll put them in the mail tomorrow. This week I'm giving away two mysteries set in the art world of San Francisco, with very different amateur sleuths. 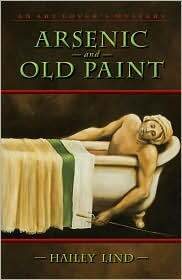 Arsenic and Old Paint is the latest book in Hailey Lind's Art Lover's Mystery series. Annie Kincaid is a former art forger, now operating a legitimate decorative painting business. But, her partner, a former art thief, and her propensity for stumbling on murder scenes, continue to get her in trouble. This time, when she finds a body in a bathtub, his pose resembles David's Death of Marat. Only Annie. Then there's Dani O'Rourke, who raises funds for the Devor Museum in San Francisco. She was in the restroom when a body plummeted from her office window. Too bad it was in the middle of a gala evening, an event that could spoil her job. 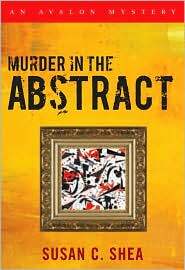 Her insider's understanding of the art world, and the world of money, takes her from San Francisco to Santa Fe in Murder in the Abstract by Susan C. Shea. So, do you want to read Arsenic and Old Paint or Murder in the Abstract? You can enter to win both, but I need separate entries. Email me at lholstine@yahoo.com. Your subject line should read either "Win Arsenic" or "Win Abstract." Your message should include your mailing address. Entrants only in the U.S., please. The contest will end Thursday, Oct. 7th at 6 p.m. PT. The winners will be selected by random number generator. I'll notify the winners and mail the books the next day. Good luck! Thank you so much, Lesa. I do like Laura Lippman's stand-alones very much and have stayed up till the wee hours quickly turning pages with all of them that I've read. And I had seen her on tv talking about the book and that interested me a lot. I expect this to be a very thought-provoking read, a page-turner, for sure. My best wishes to you and the Holstine cat family. You're welcome, kathy! I hope you come back here, on one of the blog postings, and let us know what you thought! And, it's good to have you in the community of crime fiction readers!